I'm a huge Dr. Who fan so when I saw this, I had to share it. Isn't it awesome?! And check out this crazy little guy I found at HistoricLOLS.com. I like the Historical Cat photo; cute. Have fun at your class reunion. OMG! I love it! That's a great one! I do believe that you and I are kindred spirits! We really need to get together for lunch sometime! You are so cool! Have fun and be sure to share!! Haha! 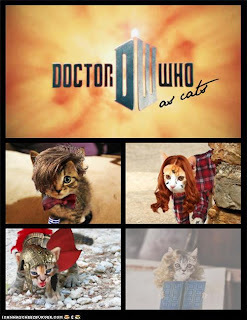 That's one handsome Dr. Who cat. Thank you for hosting Michelle - I truly look forward to visiting you each week! I am hosting a wonderful cookbook giveaway for my followers - be sure to check it out on your visit! LOL! How cute they are!